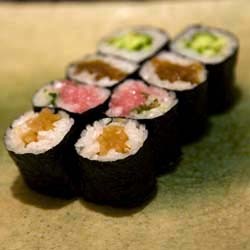 Tokyo is known as a mecca for sushi, and the origin of nigiri sushi as we know it today got its start during the Edo era as a snack sold by street vendors. 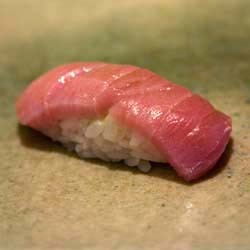 It was called Edomae-zushi (literally, “in front of Edo sushi” named for the bay where the fresh fish and seaweed were brought in and sold.) 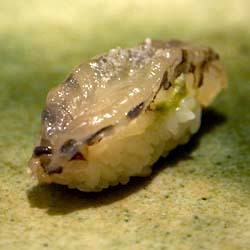 Understandably, visitors to Tokyo often have sushi at the top of their dining lists. But if your time is limited, such as ours was during a visit in May, and you only had time to visit one, which should it be? We chose the most expensive omakase (chef’s choice) lunch course for ¥8,000, which included 15 different kinds of sushi, including the infamous odori-ebi (dancing shrimp, so named because they are eaten alive; thankfully, mine wasn’t moving). 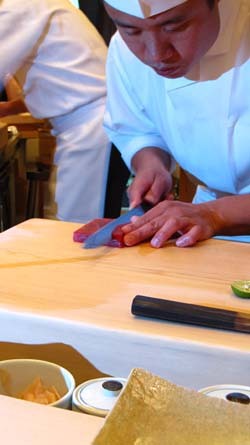 Like all high-end sushiya, each piece was made and then immediately served, one piece at a time. After the first piece, Gouke-san asked us if the amount of rice was to our liking, and we could ask for more or less, according to taste. 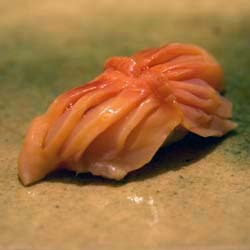 These were brushed with either soy sauce (a light touch) or sprinkled with salt, or a combination of salt and sudachi (citron) or ginger, etc. to bring out the best flavors of each type of neta. And as soon as he noticed I was left handed, he placed each piece diagonally towards my left- instead of right- hand. The experience was a revelation. 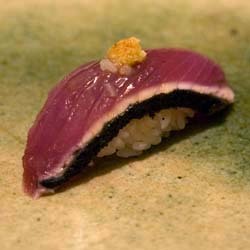 I now know what real sushi should taste like, and I honestly haven’t craved it since that fateful day. 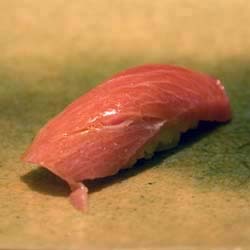 I realized that most sushi is flavorless and bland — a poor shadow of what it can be. Drats. 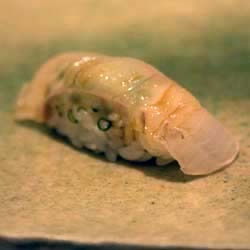 Now I have to go back to Japan to visit Kyubey (or another top Tokyo sushiya) to satisfy my sushi craving. Even if $90 seems like alot to pay for lunch, it's actually quite a bargain for such quality. 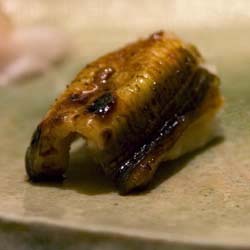 While I've heard that the quality of the neta is even higher at upscale sushiya during dinner, prices are much higher as well. 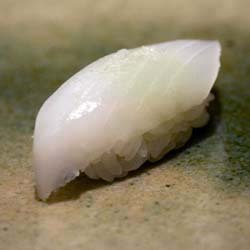 Left: At Kyubey, the sushi is served one by one. From top to bottom, left to right: Chutoro; Hirame with sudachi and chive; Aori ika with salt; Uni; Odori ebi; Aka-gai; Toro; Katsuo with ginger and garlic, Anago; Shinko-maki. People say that you can judge a sushiya by its tamagoyaki, and Kyubey’s is no exception. 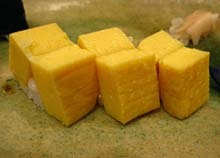 Sweet and almost cake-like, it is served towards the end of the meal (with or without rice). 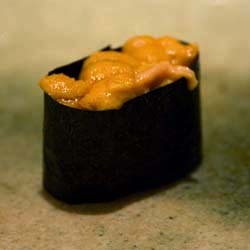 Theirs includes ground shrimp, which lends a fluffy, lighter-than-air texture and enhances the flavor of the egg. The secret is the level of fine grinding and slow roasting, accomplished by hot coals placed atop the egg mixture and moved carefully along until it is set.